I am glad that Scrum Process Canvas can automatically produce reports based on the information our team have entered throughout the project. However, can I create a custom report myself? I want to form our own reports with information gathered under different Scrum activities. For instance, to form a backlog report with vision + backlog sprint planning discussion. Select Tools > Doc. Composer from the main menu. From Diagram Navigator, select the data you need to show in your report, and then drag it onto the report editor. 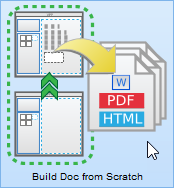 After that you can export your document to document - Word, PDF, HTML. Hope this helps. Feel free to contact us if you need any help.